The city of Hillsboro is in a great location because it is not in the downtown city, but it is not way out in the rural areas. But do to its location between the forest and city, it is a perfect location for all kinds of critter problems. One that can really cause a stink, are skunks moving into your property. Skunk's are known for there ability to spray a dangerous spray on or at anything that is bothering them. This risk becomes even greater when there is a mother that has baby skunks. Skunk's normal only spray when they are very threatened or startled. We also get many calls from customers that have trapped a skunk on there property. but then do not know what to do. We are able to come out and pick up the skunk and remove it from your property. Another important thing to remember is not seal up a deck or under your house until you are positive there is nothing left underneath. Skunk Raccoon Beaver Squirrel Coyote Mole, Gopher, or Vole Rodent Bird Bat Dead Animal Removal Attic Clean Out or Sanitation I have NO idea!! 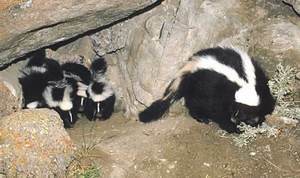 Family of skunks living under your shed or out building. Skunk spray's in your back yard and the smell has carried into your house. Dog or pet sprayed from a skunk. Skunk's living under your deck. One of the most common locations to have a skunk move into your property is under a shed or out building. They will dig underneath to create a den to live in. The longer they live in those areas the more likely other skunks are to move in or investigate that location. The best thing to do is contact a professional and have them remove the skunk's from under your shed. For Hillsboro Skunk Control and Removal Call 503-201-2432!